Remember, the DoJo-Go-Pro-O-Meter is not interested in hearsay, rumors, or gossip… only fact. Stan Heath had an interesting quote in an entry on Scott Carter’s blog that warranted a change in the meter. That made me wonder if Heath had had any players leave early for the NBA at Arkansas. (He wasn’t at Kent State long enough for that to happen.) The only one that did so was Ronnie Brewer, who gave up his senior year to enter the NBA Draft. Jones and Brewer had similar production in their junior year, although Brewer’s measurables were a little better. The Jazz took Brewer 14th overall in 2006, making him the last lottery pick. Brewer declared for the NBA Draft in late April that year, but didn’t hire an agent right away. Heath’s quote at the time was interesting. So it stands to reason that if Dominique Jones were to make a move up draft boards – say, if he goes off in the NIT and the Bulls end up winning the thing – Heath would recognize DoJo’s opportunity and not stand in his way. Based on this, the DoJo-Go-Pro-O-Meter is being adjusted up to 40%. 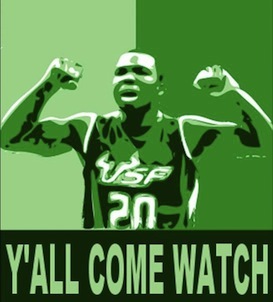 USF fans are already working themselves up into a lather about whether or not Dominique Jones will go into the NBA Draft. And in the absence of solid information, many are believing whatever they want to believe, even going to Steve Duemig-like “you don’t know what I know” lengths with what is probably second or third-hand information. 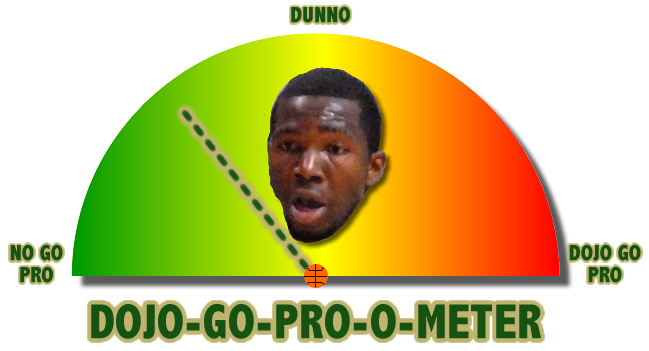 The DoJo-Go-Pro-O-Meter represents our best guess at the odds of DoJo going pro, based on news reports and other hard evidence. No gossip, no hearsay, no friend of a friend. The meter goes from 0% to 100%, and will only reach one of those two points when a final decision is made. Based on this story, and the collection of NBA mock drafts that mostly have Jones taken in the second round (where contracts are not guaranteed) or not at all, we are setting the DoJo-Go-Pro-O-Meter at 30% to start. As more news comes out, we will make adjustments as necessary. USF-Georgetown LiveBlog from Vegas Baby! I was gearing up to make the case for Dominique Jones being on the All-Big East first team, figuring they wouldn’t be announced for a few days. Instead, the Big East announced the teams this morning and DoJo made the list. He’s the second USF player ever named to the All-Big East first team. The first was Kentrell Gransberry two years ago. One of the six players on the All-Big East first team will be named conference player of the year on Tuesday. Scottie Reynolds was the only unanimous selection to the first team, so he’s probably the favorite for that award. Greg Monroe, Georgetown, C, So., 6-11, 247, New Orleans, La. Luke Harangody, Notre Dame, F, Sr., 6-8, 255, Schererville, Ind. Dominique Jones, USF, G, Jr., 6-4, 205, Lake Wales, Fla.
Scottie Reynolds, Villanova, G, Sr., 6-2, 190, Herndon, Va.
Da’Sean Butler, West Virginia, F, Sr., 6-7, 225, Newark, N.J.
P.S. I think Lazar Hayward got screwed. Can We Play Them More? If you’re an old-timer (or a semi old-timer like me), it felt really nice to finally win an important game against Cincinnati. I know that isn’t the same team as it was when Huggins was there. Among other things, their players graduate now, and they don’t punch police horses and/or spend any time in jail. But still, USF must have lost The Big Game at Home to the Bearcats at least a half-dozen times over the years. 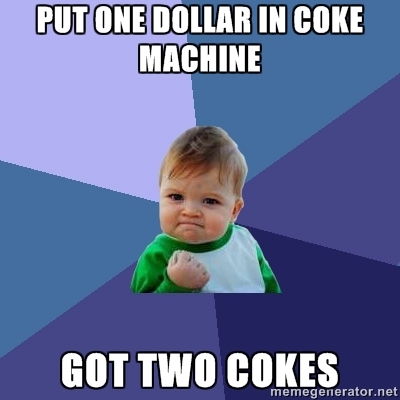 Finally they get one, and without much drama or suspense. It looked like Heath’s game plan changed a bit with Famous out. Shorthanded and realizing that he didn’t have much of a bench or a front line to defend the rim, Heath decided to make the game really short, stretch out possessions, and play some mean perimeter defense with his guards. It wasn’t exactly a fun game to watch, but as far as a way to win, it did the trick nicely. Cincinnati had nothing in the first half. Then they came out in the second half and had even less. They really struggled with ball handling (they fumbled at least three or four balls away), running their offense, and capitalizing on their second-chance opportunities. There were a lot of misses around the rim. But credit is due to the Bulls’ defense because they were in Cincinnati’s face all night long. The man-to-man D was fierce tonight. With eight minutes left the Bulls had only given up 30 points. Until the Bearcats emptied the paint and started driving to the rim to either score or draw contact, they couldn’t go anywhere. Lance Stephenson only had four points and one field goal, and Deonta Wright scored most of his points in garbage time. The Bearcats had the same defensive strategy that Notre Dame and Marquette offered up. Press Dominique Jones, help on defense when he tries to get to the rim, get the ball out of his hands, and make everyone else beat them. They did a decent job of it for awhile, but tonight the Bulls made more outside shots. The Bulls spaced out better on set plays for Jones, and Mike Mercer and Anthony Crater both shot well from the perimeter in the first half. When Cincinnati had to pay more attention to the shooters, and eventually had to start trapping to try and get back in the game, DoJo found more room to operate in the second half. The fouls piled up, Jones lived at the free throw line, and he ended up with 26 points. – Nice crowd tonight. A lot of people showed up late because the game started at 7 instead of 7:30, but the lower two levels were pretty much full. Everyone make sure you’re on time for the game on Saturday… it starts at high noon. – I know Toarlyn Fitzpatrick is a freshman and hopefully he has a lot of development ahead of him, but man did he struggle tonight. Without Famous to back him up and with Gus still not quite 100%, he had to shoulder more of the load than he could handle. He couldn’t keep Ibrahima Thomas off the offensive glass (good thing Thomas missed so many putbacks), he still looks confused on defensive rotations, and let’s all just agree that his botched layup/dunk/whatever that was in the second half never happened. – OK, remember when the clock stopped in the first few minutes of the second half? The game clock and shot clock both stopped, and when Heath pointed it out, the refs stopped the game and took 6 seconds off the shot clock. Not only was that way more than 6 seconds – it was more like 20 – but the refs never adjusted the game clock. Bad job by them. Fortunately that didn’t end up being a factor. – Skip Holtz’s glowing review of the Embassy Suites breakfast buffet made me hungry and strangely motivated. I was ready to run through a brick wall to get that man a waffle. St. John’s is up next in a Saturday matinee. Once again, tipoff is at 12 noon. Not 12:30. Not 1:00. Be there. On time if possible.